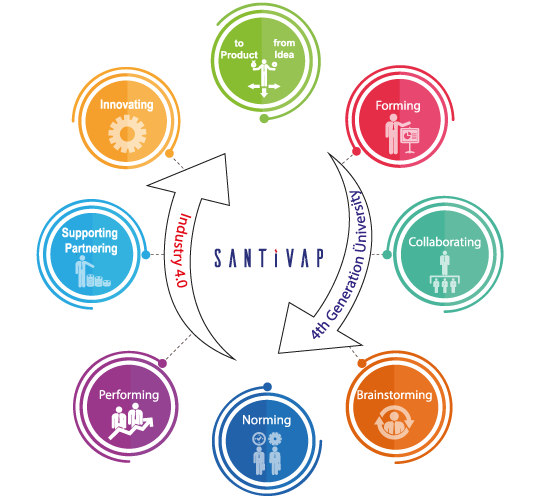 SANKO University Technology and Innovation Ecosystem Project (SANTIVAP) consists of project clusters, national and international cooperation networks. Cooperation within the scope of this project provides coordination in terms of providing projects. It is expected to form project groups thanks to cooperation among participants and guests and the Project groups should work up AR–GE projects. The reasons of why this corporation is a model project It is important to make the information a production. To do this, we need scientific organizations making international corporations easier.Scientific diplomacy aims international corporation to solve the common problems of societies. As a scientific organization, SANTIVAP establishes an environment for sustainable scientific diplomacy. Scientific organizations organised in our country are usually conducted especially only for a branch of expertise and thus cause a closed system in the end. This prevents interdisciplinary approach and working environment. However, the advancement of science is possible through the convergence of diverse disciplinary perspectives and the attainment of a common outcome. In the congress, ecosystems will be created under 6 different titles. These ecosystem members will be able to share their ideas in a separate environment, develop joint projects or participate in existing ones. -	representatives of industrial establishments. We strongly believe that we will be able to create a program to improve economic transformation in the short term with the creation of sustainable working groups. You are also welcome to present your project ideas on the last day of the congress. Furthermore, you are encouraged to present your research (up to 3 minutes and 3 slides), in which you can showcase your competences in order to become a partner with the presented ideas. The number of presentations is limited to 25 people for each ecosystem in the scope of our event. Registration and detailed information can be found at www.tiptainovasyon.org. Participants of the congress will also have a chance to write a chapter for a series of a book recommended by an international Publisher. The book chapters will be based on the ecosystems to be created.